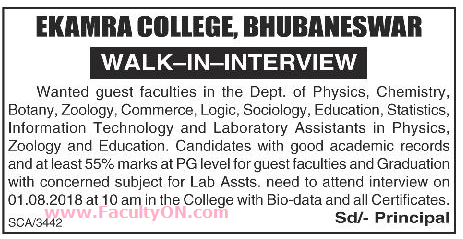 Ekamra College, Bhubaneswar has advertised in the SAMAJA newspaper for the recruitment of Teaching Faculty- Guest Faculty Plus Lab Assistants jobs vacancies. Interested and eligible job aspirants are requested to walk-in on 01st August 2018 . Check out further more details below. College Profile: Ekamra College is the oldest non-govt. aided college in Bhubaneswar .It came into being to meet the growing demand for expansion of higher educational institution in this burgeoning city. In July, 1978 under the stewardship of Late Dr.Harekrushna Mahtab a group of enthusiastic members gathered at EkamraNivas to give shape to his dream. On 22nd August, 1978, the College started functioning in the premises of B. B. High School and was formally inaugurated on 6th of September the same year. How to Apply: The candidates are requested to attend the Walk-in interview along with CV, originals & photocopies of certificates and recent colour PP size photos to the walk-in address provided below.